The Kenmore front-loading automatic washer automatically locks when a wash cycle is currently in progress and prevents accidental opening of the washer's door until the cycle is finished. Manually unlocking the washer is necessary if you need to cancel the cycle, remove clothing or add clothing to the wash after you start the washing cycle. 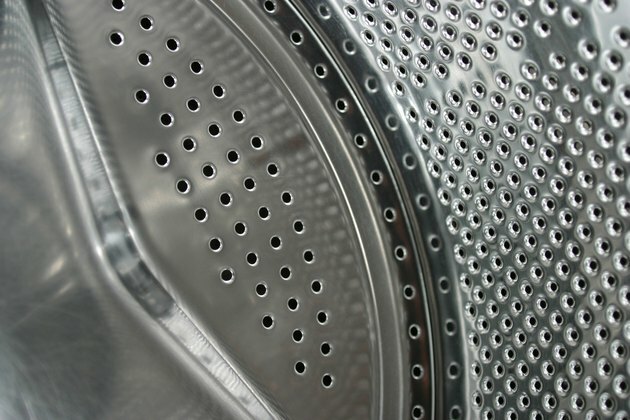 The washer remains paused until the cleaning cycle is restarted or canceled and is controlled using the washer's control panel. Manually unlock the Kenmore washer to add or remove clothing. Touch "Control Lock" for five seconds until "CL" disappears from the washer's display to unlock the control panel. Press "Start/Pause" to manually pause the cleaning cycle. Push "Power" three times and press "Spin Speed" if the washer is filled with water. The cycle drains from the washer's drum and enables you to safely open the door. The washer will not unlock if the washer is filled with water, as water would spill out of the machine. Pull the door's handle to open the door and add or remove the clothing from the washer. Shut the washer door and turn the cycle knob to choose the type of cleaning cycle. Push "Wash/Rinse" to select the temperature and press "Spin Speed" to select the spin cycle level. Push "Start/Pause" to begin the cleaning cycle.